Styx has been selling this CD set as separate discs at their shows for a while, but it’s now been released as a two CD set for sale everywhere. The concept might seem strange, recording new versions of old songs, but it’s not new. Vanilla Fudge did something similar a while back basically to get the rights to their music back. Uriah Heep recently released a similar set as a means to show the way the newer version of the group play the old classics. Whatever the reason, though, this is a killer set of tunes that everyone should recognize. There’s one brand new song and two Damn Yankees tracks done as Styx songs. Sure, Dennis DeYoung is missed here, but he’s no longer in Styx, get over it. This is a great set of music that just plain rocks. Styx show that they can still pull it off in style. I’ve basically covered the track by track review by comparing the new versions to the old ones. After all, that’s part of the key here. This is so similar to the original version, at least at the beginning, you might think it’s the same recording. As it moves out to the song proper it does feel a little different. Even the Dennis DeYoung vocal parts seem quite close, though. I think I prefer the original version, but not by much. The changes here are very fractional, and really this does pretty much match the original. The guitar solo, though, is a bit meaner on this rendition. This one is even closer to the original than the first number was. The main difference I can hear is that the bass guitar sounds different. I’m not saying it’s playing anything different, but it’s a different type of bass and produced differently than the original. Of course, I’m a bass player and used to cover this song, so I really notice that. Here is a song that was really a Dennis DeYoung trademark, so it seems a likely place to hear big differences. Those differences are quite obvious on the verses. The chorus section, though, works quite well and feels very similar to the original rendition. All in all, it’s a good rendition. The original has years of burning into the mind to be overcome, though. Perhaps this isn’t the greatest Styx song of all time. Still, it’s always been a strong melodic rocker. This version feels so much like the original it might be tough to tell the difference without listening to them side by side. Since this cut was always a Tommy Shaw showpiece, it shouldn’t be a shock that this version is very faithful to the original Styx recording. That said, there seems to be a bit more energy and “oomph” on the instrumental section and harder rocking motif later. That makes this one, in my book, stronger than the original version. Another song original sung by DeYoung, somehow the vocal performance on this seems closer to the Grand Illusion album version. In fact, while I can hear some minor differences on the vocals, this one really does a great job of capturing the sound and magic of the rendition everyone is used to hearing. That said, there are some distinct differences in later portions of the song. For one thing, the guitar soloing seems to give the track a more “rock and roll” feeling and some of the vocals seem to have more layers than on the DeYoung fronted rendition. It’s refreshing to see real differences in the arrangement, but I think I prefer the original version. Here is a brand new Styx song. It starts as an acoustic guitar based ballad and grows gradually upward from there. This is definitely a dead ringer for the original version. With the current state of the economy this song might be more relevant today than when it was originally recorded. “Miss America” was always one of Styx’ hardest rocking tunes. This rendition seems even harder edged than the original studio take. It’s a killer tune, either way. The vocal delivery on the closing section is particularly cool. In fact, I think I like this rendition better than the original recording from Grand Illusion. Here’s another that seems very close to the original take on the piece. The later segments of the track feel a bit different. It seems to have a more modern edge to it, but still based in that classic Styx sound. 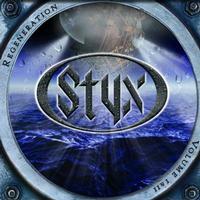 Here’s another hard rocking Styx classic. This one feels very close to the original rendition. This gentle number does a good job of keeping the old-time European element while bringing a bit more of a rock feeling. It’s not the kind of thing where you can really pin-point a difference, but the original always seemed a little too precious. This one still sounds the same, but loses that “over the top” element at the same time. Here’s another that feels virtually unchanged from the original. It seems like it might be a little more straightforward, but that’s questionable. Certainly the production is more up to date. A song about cocaine addiction, this rocker seems to work even better in the new recording. It’s always been a favorite of mine and it’s just plain rocks here. One of two songs originally done by Shaw’s Damn Yankees that are now also Styx tunes, this is a straightforward rocker with a great vocal arrangement and catchy hook. It does sound more like Styx here than it does like Damn Yankees. A ballad, this is pretty and quite tasty. It’s the other Damn Yankees song that’s now being performed by Styx. Other than some keyboard work that’s added, this seems pretty close to the original. It has less of that Styx element than the other Damn Yankees tune had.